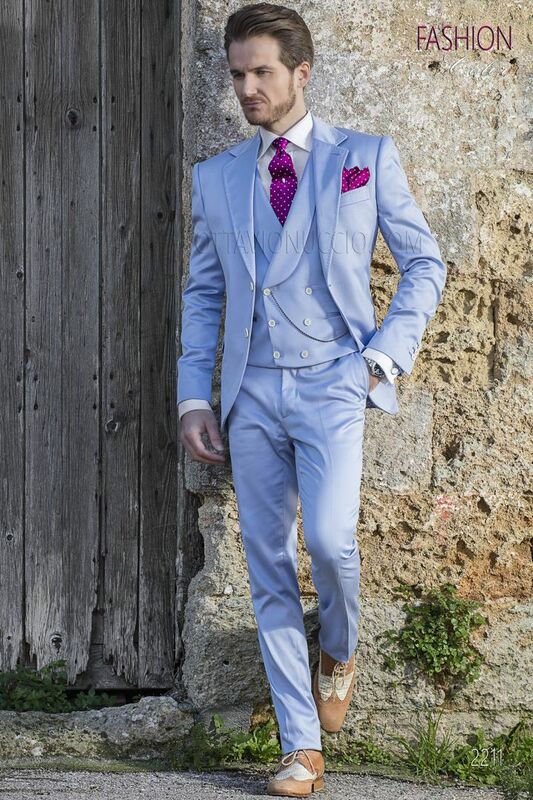 Sky blue cotton satin men suit. Topstitch at 6mm from the edges of the front, collar, pocket flaps, cuffs and chest pock... Sky blue cotton satin men suit. Topstitch at 6mm from the edges of the front, collar, pocket flaps, cuffs and chest pocket. Notched lapel with 2 buttons closure. Flap pockets, ticket pocket and angled buttonholes. 4 signature buttons and open buttonholes at cuffs. Light blue in cotton satin Double-breasted waistcoat and 6 corozo ONGala customized buttons.